An underground stem which grows outward from the plant, eventually emerging above ground as a shoot that forms a new plant of the same cultivar; roots and additional shoots can also be produced along the rhizome. Said of a plant that generates new plants from elongated underground stems called rhizomes. Example, H. Fulva “Europa”. The image below shows the rhizome highlighted. This is growing between the roots of two separate plants but joining them together underground. 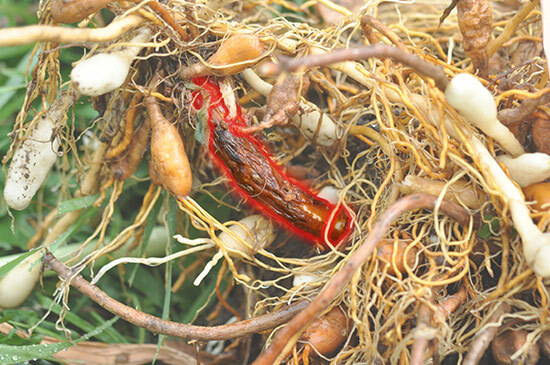 The second plant formed at the end of this rhizome.